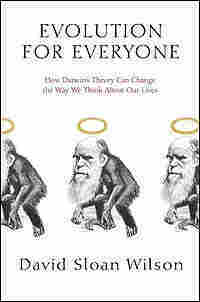 Excerpt: 'Evolution for Everyone' Is evolution for everyone? Dr. David Sloan Wilson of Binghamton University argues that science and religion can coexist peacefully. His book strives "to harmonize evolution and religion in a noncontroversial manner." Find more recommendations from Bill Jaker, host of WSKG's Off the Page. This is a book of tall claims about evolution: that it can become uncontroversial; that the basic principles are easy to learn; that everyone should want to learn them, once their implications are understood; that evolution and religion, those old enemies who currently occupy opposite corners of human thought, can be brought harmoniously together. Can these claims possibly be true? Isn't evolution the most controversial theory the world has ever seen? Since it's a scientific subject, isn't it hard to learn? If the implications are benign, then why all the fear and trembling? And how on earth can the old enemies of evolution and religion do anything other than come out of their opposite corners fighting? I might be an optimist, but I am not naive. Allow me to introduce myself: I am an evolutionist, which means that I use the principles of evolution to understand the world around me. I would be an evolutionary biologist if I restricted myself to the topics typically associated with biology, but I include all things human along with the rest of life. That makes me an evolutionist without any qualifiers. I and my fellow evolutionists study the length and breadth of creation, from the origin of life to religion. I therefore have a pretty good idea of what people think about evolution, and I can report that the situation is much worse than you probably think. Let me show you how bad it is before explaining why I remain confident about accomplishing the objectives of this book. Most people are familiar with the reluctance of the general public to accept the theory of evolution, especially in the United States of America. According to the most recent Harris Poll, 54 percent of U.S. adults believe that humans did not develop from earlier species. That is up from 46 percent in 1994. Rejection of evolution extends to beliefs about the origin of other species, the fossil record as evidence for evolution, and the constant refrain that evolution is "just a theory." To make matters worse, most people who do accept evolutionary theory don't use it to understand the world around them. For them it's about dinosaurs, fossils, and humans evolving from apes, not the current environment or human condition. The polls don't measure the fraction of people who relate evolution to their daily lives, but it would be minuscule. It's easy for scientists and intellectuals to smile at the ignorance of religious believers and the general public, but the fact is that they're not much better. The Ivory Tower would be more aptly named the Ivory Archipelago. It consists of hundreds of isolated subjects, each divided into smaller subjects in an almost infinite progression. People are examined less with a microscope than with a kaleidoscope—psychology, anthropology, economics, political science, sociology, history, art, literature, philosophy, gender studies, ethnic studies. Each perspective has its own history and special assumptions. One person's heresy is another's commonplace. With respect to evolution, most scientists and intellectuals would say that they accept Darwin's theory, but many would deny its relevance to human affairs or would blandly acknowledge its relevance without using it themselves in their professional or daily lives. In effect, there is a wall within academia that restricts the study of evolution to biology and a few human-related subjects such as human genetics, physical anthropology, and specialized branches of psychology. Outside this wall, it is possible for a person to get a Ph.D. without a single course in evolution or more than a casual reference to evolution in other courses. That is why the term "evolutionary biologist" sounds familiar while the more general term "evolutionist" has a strange ring. The result is an ideological outlook eerily similar to that of religious creationism. Like their fundamentalist Christian counterparts, the most extreme anti-biologists suggest that humans occupy a status utterly different from and clearly "above" that of all other living beings. And, like the religious fundamentalists, the new aca-demic creationists defend their stance as if all of human dignity—and all hope for the future—were at stake. Of course social scientists have no objection to applying evolutionary theory in the life sciences—biology, zoology, botany, etc. Nevertheless, the idea of applying evolutionary thinking to social science problems commonly evokes strong negative reactions. In effect, social scientists treat the life sciences as enclosed within a kind of impermeable wall. Inside the wall, evolutionary thinking is deemed capable of producing powerful and astonishing truths. Outside the wall, in the realm of human behavior, applications of evolutionary thinking are typically treated as irrelevant at best; usually as pernicious, wrong, and downright dangerous. It might seem that the situation can't get more bleak, but it does. Evolutionary biologists are themselves conflicted about the study of our own species. When Harvard evolutionary biologist Edward O. Wilson published his encyclopedic book Sociobiology in 1975, his fiercest critics were fellow Harvard evolutionary biologists Stephen Jay Gould and Richard Lewontin. Fast-forwarding to the present, the National Science Foundation's most recent and ambitious effort to fund evolutionary research is called the National Evolutionary Synthesis Center (NESCent), whose basic mission is to "help foster a grand synthesis of the biological disciplines through the unifying principle of descent with modification." This language is not as grandiose as it might seem. Biologists expect evolution to serve as a unifying theory, delivering "powerful and astonishing truths," as Ian Lustick put it. Yet, as a curious complement to his diagnosis of the social sciences, not a single member of NESCent's scientific advisory board represents a human-related subject apart from human genetics. It seems that the barrier separating the study of humans from the study of the rest of life is largely respected on both sides, even by evolutionary biologists who are trying to foster a grand synthesis. Knowing all of this, I remain confident that there is a path around both walls of resistance, the first denying evolution altogether and the second denying its relevance to human affairs. Darwin provides an example for us to emulate: on any given day of his life he might have been found dissecting barnacles, minutely observing the behavior of his children, or germinating seeds that had first been fed to mice, which in turn had been fed to hawks at the London Zoo. The same person who studied earthworms and orchids also studied human morality. Darwin's interests were so far-flung that his mail came by the wagonload from all corners of the globe. One letter about plant distributions in India might be followed by another on the emotional expressions of African natives. Darwin's empire of thought was larger than the British Empire. How was Darwin able to unite so many subjects and blend humans seamlessly with the rest of life? Perhaps he was a genius. Perhaps there was less to know back then. Perhaps, but the main reason is more interesting and relevant to our own situation. It was primarily Darwin's theory, not his personal attributes or time and place, that enabled him to build his empire of thought. Moreover, his theory was powerful even in a rudimentary form, because Darwin knew so much less about the details of evolution than we do now. The same theory enables modern evolutionists to build empires of their own. I'm no Darwin, but my own career shows what a good theory can do. I have studied creatures as diverse as bacteria, beetles, and birds. I have studied topics as diverse as altruism, mating, and the origin of species. I can understand and enjoy the work of my colleagues who study an even greater range of creatures and topics. Please don't think that I am boasting about myself—that would be boring. I am boasting about the theory, and the whole point of this book is to show how anyone can profit from it. It takes a great theory, not great intelligence, to acquire this kind of synthetic knowledge. If our own species can be included in this grand synthesis, there is every reason to do so. It would be like a strange figure emerging from the shadows to enjoy the warmth of a campfire with good company. My own career shows that this is possible. Just like Darwin—not because I share his personal attributes but because I share his theory—I have seamlessly added humans to the bestiary of animals that I study, on topics as diverse as altruism, beauty, decision making, gossip, personality, and religion. I publish in anthropology, economic, philosophy, and psychology journals in addition to my biological research. My books are on subjects that most people don't associate with evolution: Unto Others: The Evolution and Psychology of Unselfish Behavior (co-written with a world-class philosopher named Elliott Sober), Darwin's Cathedral: Evolution, Religion, and the Nature of Society, and The Literary Animal: Evolution and the Nature of Narrative (co-edited with a bold young literary scholar named Jonathan Gottschall). These are not popular accounts watered down for a general audience. They are written for the experts, most of whom spend their lives studying a much smaller range of subjects. Evolutionists can stride across human-related subjects at the highest level of intellectual discourse, in the same way that evolutionary biologists are already accustomed to striding across biological subjects. Darwin should be emulated in another respect. His interactions with people from all walks of life were primarily respectful and cordial. We can learn from his humility and good humor in presenting his theory to others, in addition to the theory itself. Since writing Unto Others and Darwin's Cathedral, I have spoken about evolution, morality, and religion to diverse audiences around the world. Perhaps my most memorable experience was a televised conversation with a group of faculty and monks from St. John's University in Minnesota, a Catholic university and the oldest Benedictine monastery in North America. My co-author Elliott Sober was invited to converse with His Holiness the Dalai Lama, making me unspeakably jealous. These encounters are the very opposite of the sterile "debates" that are staged between creationists and evolutionists. If this kind of cordial dialogue can take place for evolution and religion, then surely it can take place for evolution and any other human-related topic. Excerpted from Evolution for Everyone by David Sloan Wilson Copyright © 2007 by David Sloan Wilson . Excerpted by permission of Delacorte Press, a division of Random House, Inc. All rights reserved. No part of this excerpt may be reproduced or reprinted without permission in writing from the publisher.